Mom has always admonished us not to play with our food, and to provide what we eat with the proper respect. After all, the backbreaking work of farmers alongside other people in the food chain all help to make what you are about to chow down a reality. Still, there are times when it can be really fun to let your hair down, and while a food fight in definitely inappropriate, how about tossing some marshmallows through a hoop? 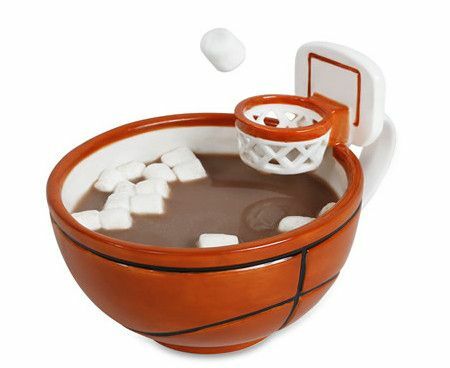 This is made possible using the $24.95 Hoopster’s Free Throw Mug, which will let you dunk your marshmallows in hot chocolate even if you miss, making this a win-win situation for everyone along the way, thanks to an integrated miniature basketball hoop in the mug itself.